Sunny Garcia "2010 Surf Champion"
Born on the Westside of Oahu in 1970, Sunny was raised in Waianae and is a all-time winner of the Van’s Triple Crown of Surfing and was the 2000 ASP World Champion. He began surfing at age seven, won the boys’ division of the 1984 United States Surfing Championships, then dropped out of school in the ninth grade to turn pro. Two years later, at age 17, he was the 17th ranked surfer in the world, and already regarded as one of the sport’s great power surfers, later to be recognized as an elegant tube-rider at places like Backdoor Pipeline in Hawaii, one of the surfbreak sites of his many Vans Triple Crown victories. Outside of surfing Sunny achieved stardom by starring in the WB’s “North Shore”, but becoming the 2000 ASP WCT World Champion was his greatest achievement, he also competively Garcia holds the record for most WQS event wins at twenty-two to go with his six Van’s Triple Crown of Surfing championships. 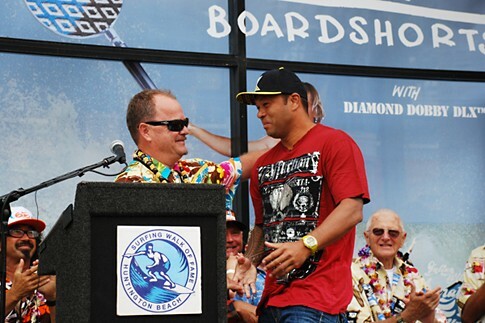 Sunny was the second professional surfer to win over $1 million in prize money.